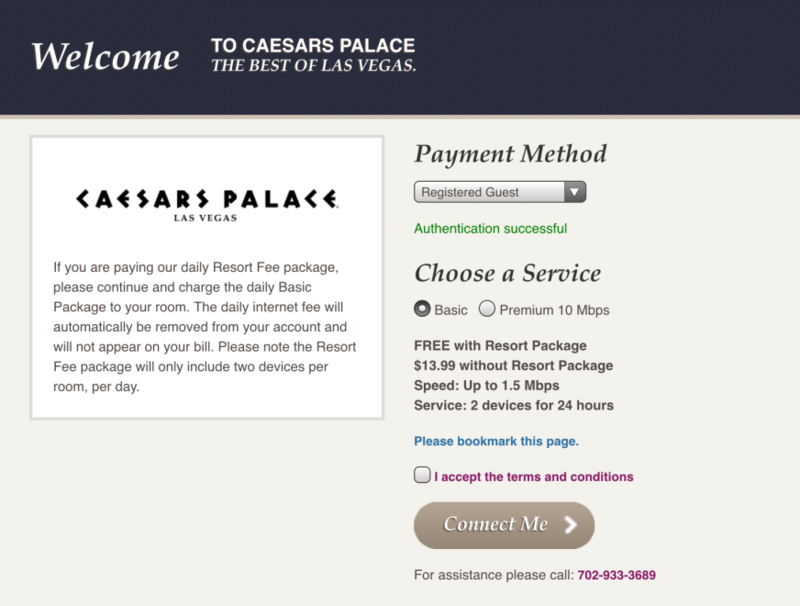 The wireless infrastructure in the Caesars Palace conference center is newly renovated and is set up for wireless Internet access at NO CHARGE to conference attendees. While in your guest room, please see the Guest Room steps below. NOTE: In order to provide the best wireless experience possible for conference attendees, the ILTACON_LegacyDevices (2.4 GHz) signal will only be available in select areas of the convention center (). The ILTA Events mobile app will have additional details under the “Important Info” section. Thanks to our sponsor American Legalnet Inc. for sponsoring the wireless access in the conference center. All ILTA guests receive complimentary in-room basic wireless Internet for one device per day as part of their resort fee. ILTA guests are not required to participate in the resort fee but may opt in at check-in. 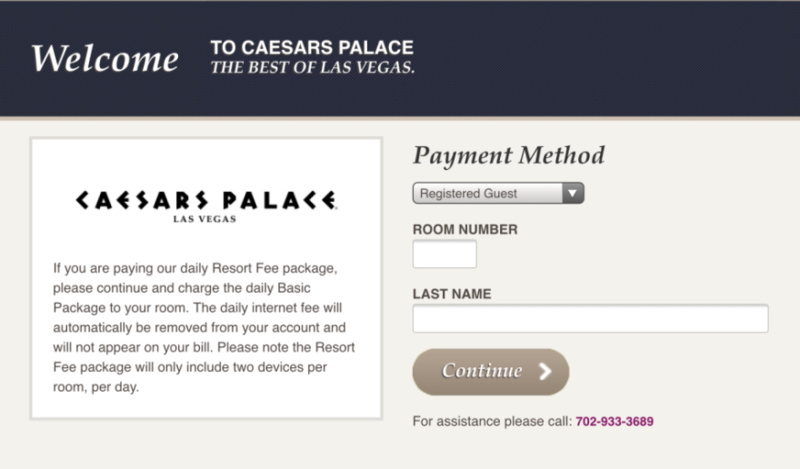 Log in to the Caesars Palace in-room Internet by selecting “Registered Guest” for payment method and inputting room number and last name. Select "Basic" service and accept the terms and conditions. * For ILTA guests, the daily Internet fee for one device will automatically be removed from the room folio daily and will not appear on the bill. Why is 2.4 GHz being offered in only limited areas in the conference center? Nearly all of the mobile smartphones and tablets that have been made in the last 3 years support the better 5GHz Wi-Fi, which provides higher bandwidth (it's faster) and it operates on a much less constricted set of radio channels. This means that you can have more mobile devices in use simultaneously with 5GHz vs. 2.4GHz. Older devices like the iPhone 4 and 4S only support the 2.4GHz band (which is slower) and those devices have to compete with one another for the very limited radio band that 2.4GHz is forced to operate within. When wireless access points (WAPs) are deployed and configured for customer use, they are setup based on anticipated needs. A WAP will contain a certain number of radios inside of it (typically 2, 4 or 8), and each radio can be configured to operate at either the older 2.4GHz band or at the newer 5GHz band. It can't do both. This creates a dilemma. Do you configure radios to use the older 2.4GHz band knowing that only a very small percentage of users need it? And if you do so, it will greatly reduce how many users with 5GHz devices can be simultaneously supported by the remaining radios. This is the dilemma faced by those who need to provide Wi-Fi to a large audience.